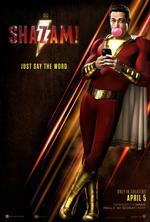 Living Room® Theaters - Shazam! "This heartfelt origin story is more than the sum of its immense charm and Spielbergian attention to detail." "SHAZAM is just a lightning bolt of unexpected joy that is certainly worth your time and money." "Supes and Bats will never die, but in SHAZAM, a character who's been around for seven decades and is only now breaking through into the mainstream, youngsters have a new family-friendly hero to call their own."